Being sick at any time is inconvenient. Every year there is another spectacular advance in some medical procedure. On the farm in the nineteen twenties treatment was particularly painful. When Judy and I grew up in the fifties things had progressed somewhat. Mustard was out, but Vicks was still in. Today the baby goes directly to the nurse instead of a home remedy. The treatments are still uncomfortable, and they might even help. 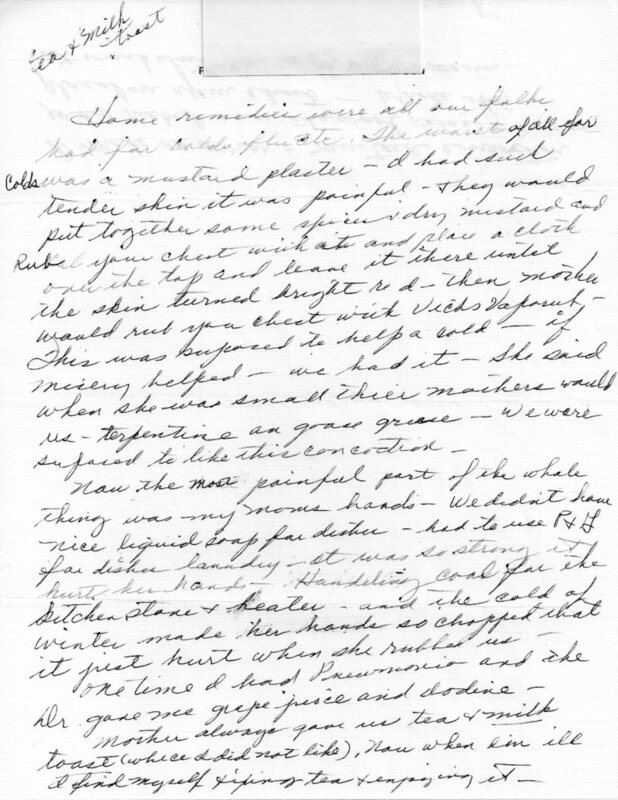 A scan of her letter is below. Home remedies were all our folks had for colds flu etc. The worst of all for colds was a mustard plaster. I had such tender skin it was painful. They would put together some spices, dry mustard and rub your chest with it and place a cloth on the top and leave it there until the skin turned bright red. Then mother would rub your chest with Vick’s Vaporub. This was supposed to help a cold. If misery helped, we had it. She said when she was small their mother would use turpentine and goose grease. We were supposed to like this concoction. Now the most painful part of the whole thing was my mom’s hands. We didn’t have nice liquid soap for dishes. Had to use P&G for dishes and laundry. It was so strong it hurt her hands. Handling coal for the kitchen stove and heater, and the cold of winter made her hands so chapped that it just hurt when she rubbed us. One time I had pneumonia and the Dr. gave me grape juice and iodine. Mother always gave us tea and milk toast (which I did not like). Now when I’m ill I find myself fixing tea and enjoying it. I made an error. Mustard concoction was rubbed over the wool piece and placed on your chest. Wrote this at work with interruptions. Sorry. 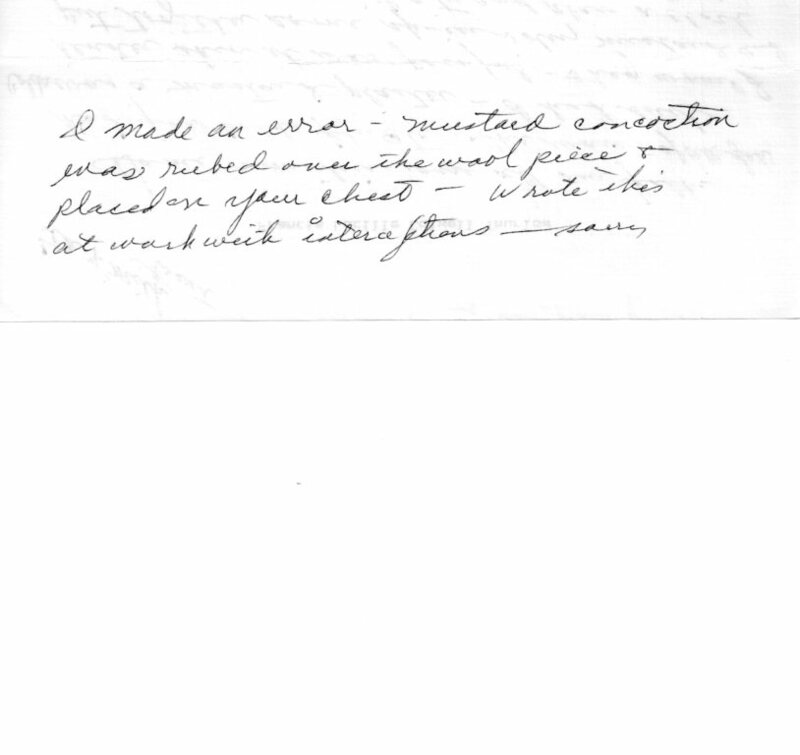 This entry was posted in Lucy's Letters and tagged pneumonia, Vicks VapoRub. Bookmark the permalink.